Obviously the first thing you need to do is download a copy of R. The current version is 3.5.2 and was released in December 2018. New releases occur every six months or so, often around April and October. You will find binaries for Windows, Mac OS X and Linux in the Comprehensive R Archive Network. Find the mirror nearest you and follow the links. The Windows installer is fairly easy to use and, after agreeing to the license terms, lets you choose which components you want to install. Additional packages can always be installed directly from R at a later time. Local Notes. R has been installed on OPR's Windows and Unix servers. Just logon to coale or lotka and compute away. We recommend that you create a shortcut to start R as part of the installation. If you skipped that step just right clicking on the executable RGui.exe, drag it to your desktop, and choose 'Create a shotcut here'. It is also a good idea to set R's working directory at this time. Right click on the shortcut, choose 'Properties' and enter your default working directory on the 'Start in' field. The working directory can also be set from within R as explained later. It's a good idea to have a separate folder for each research project. All you need to follow along is the R console as described below, but I strongly recommend that you install R Studio from www.rstudio.com, which provides a nice integrated development environment (IDE) and is available for Linux, Max OS X, and Windows. You should also know about the help function, which opens a help window. This function can be called with arguments to obtain help about specific features of R, for example help(plot). A shortcut for help on a topic is a question mark followed by the topic as in ?plot. If you picked compiled html help during the installation you should get that by default; if not you can always type options(chmhelp=TRUE). The RConsole allows command editing. You will find that the left and right arrow keys, home, end, backspace, insert, and delete work exactly as you would expect. You also get a command history: the up and down arrow keys can be used to scroll through recent commands. Thus, if you make a mistake all you need to do is press the up key to recall your last command and edit it. It is possible to prepare commands in a file and then have R execute them using the source function. You can send the output to a file instead of the RConsole by using the sink function. Both functions take a filename (in quotes) as argument. Alternatively, you may prefer to use R interactively and rely on cut and paste to transfer output from the RConsole to a word processing document. R also understands the relational operators <=, <, ==, >, >= and != for less than or equal, less than, equal, greater than, greater than or equal, and not equal. These can be used to create logical expressions that take values TRUE and FALSE (or T and F for short). Logical expressions may be combined with the logical operators | for OR and & for AND, as shown further below. The results of a calculation may be assigned to a named object. The assignment operator in R is <-, read as "gets", but by popular demand R now accepts the equal sign as well, so x <- 2 and x = 2 both assign the value 2 to a variable (technically an object) named x.
assigns π/√3 to the variable s and then prints the result. Names may contain letters, numbers or periods, and (starting with 1.9.0) the underscore character, but must start with a letter or period. (I recommend you always start names with a letter.) Thus, v.one and v_one are valid names but v one is not (because it includes a space). Warning:R is case sensitive, v.one, V.one and v.One are all different names. Note that assignments are expressions too, you can type x <- y <- 2 and both x and y will get 2. This works because the assignment y <- 2 is also an expression that takes the value 2. Exercise: What's the difference between x == 2 and x = 2? Use the console to find out. The first call repeats the vector 1:3 twice. The second call repeats each element of 1:3 twice, and could have been written rep(1:3, rep(2,3)), a common R idiom. R operations are vectorized. If x is a vector, then log(x) is a vector with the logs of the elements of x. Arithmetic and relational operators also work element by element. If x and y are vectors of the same length, then x + y is a vector with elements equal to the sum of the corresponding elements of x and y. If y is a scalar it is added to each element of x. If x and y are vectors of different lengths, the shorter one is recycled as needed, perhaps a fractional number of times (in which case you get a warning). The number of elements of a vector is returned by the function length. Individual elements are addressed using subscripts in square brackets, so x is the first element of x, x is the second, and x[length(x)] is the last. The subscript can be a vector itself, so x[1:3] is a vector consisting of the first three elements of x. A negative subscript excludes the corresponding element, so x[-1] returns a vector with all elements of x except the first one. R's (and of course S-Plus's) subscripting facility is extremely powerful. You may find that it takes a while to get used to it, but eventually the language becomes natural. The elements of a matrix may be addressed using the row and column subscripts in square brackets, separated by a comma. Thus, M[1,1] is the first element of M.
A subscript may be left blank to select an entire row or column: M[1,] is the first row and M[,1] is the first column of M. Any of the subscripts can be a vector, so M[1:2,1:2] is the upper-left 2 by 2 corner of M. Try it. The number of rows and columns of a matrix are returned by the functions nrow and ncol. To transpose a matrix use the function t. The matrix multiplication operator is %*%. Matrix inversion is done by the function solve. See the linear regression section for an example. Exercise: How do you list the last element of a matrix? R has very extensive and powerful graphic facilities. In the example below we use seq to create equally spaced points between -3 and 3 in steps of 0.1 (that's 61 points). Then we call the function dnorm to calculate the standard normal density evaluated at those points, we plot it, and add a title in a nice shade of blue. Note that we are able to add the title to the current plot in a separate call. Arguments to a function can be specified by position or by name. The plot function expects the first two arguments to be vectors giving the x and y coordinates of the points to be plotted. We also specified the type of plot. Since this is one of many optional parameters (type ?plot for details), we specified it by name as type="l" (the letter el). This indicates that we want the points joined to form a line, rather than the default which is to plot discrete points. Note that R uses the equal sign to specify named arguments to a function. The title function expects a character string with the title as the first argument. We also specified the optional argument col.main="cornflowerblue" to set the color of the title. There are 657 named colors to choose from, type colors() to see their names. The next example is based on a demo included in the R distribution and is simply meant to show off R's use of colors. We use the pie function to create a chart with 16 slices. 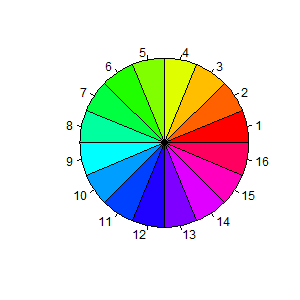 The slices are all the same width, but we fill them with different colors obtained using the rainbow function. Note the use of the rep function to replicate the number one 16 times. To see how one can specify colors and labels for the slices, try calling pie with arguments 1:4, c("r", "g", "b","w") and col=c("red,"green","blue","white"). To save a graph make sure the focus is on the graph window and choose File | Save as, from the menu. You get several choices of format, including postcript, which is good for printing, and windows metafile, which is ideal for embedding your graph in another Windows document. Most remarkably, you also get the png format, which makes it easy to include R graphs in web pages such as this, particularly now that this format is supported by all major browsers. R also supports jpeg, but I think png is better than jpeg for statistical plots. All graphs on these pages are in png format. Alternatively, you can copy the graph to the clipboard by choosing File | Copy to clipboard. You get a choice of two formats. I recommend that you use the metafile format because it's more flexible. You can then paste the graph into a word processing or spreadsheet document. You can also print the graph using File | Print. Exercise: Simulate 20 observations from the regression model Y = a+b x + e using the x vector generated above. Set a = 1 and b = 2. 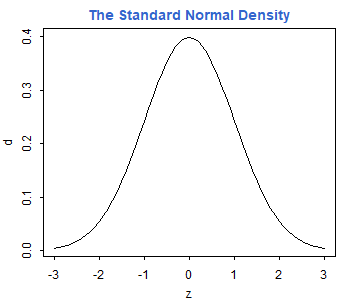 Use standard normal errors generated as rnorm(20), where 20 is the number of observations.